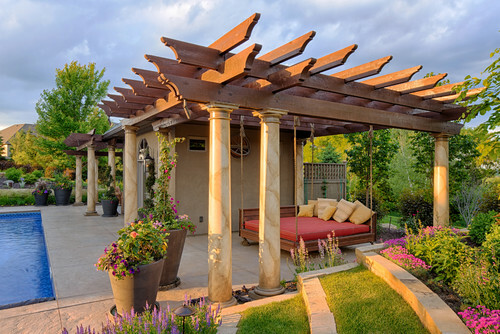 Southern Californians are fortunate to be able to use our outdoor living areas comfortably throughout the year, but backyard beds can make these spaces even more fun and functional. Adding a cozy spot where you can curl up with a good book, cuddle or catch an afternoon nap is the perfect way to make your patio or a quiet corner of your backyard more inviting. Of course, you can create an actual bedroom with walls, a ceiling, electricity and a door for privacy by installing a yurt, building a summer house or converting a shed. However, what most people want is to simply create a comfortable space with a bed — and maybe a side table — for reading, napping and occasionally sleeping under the stars. 1. Nap: Being able to comfortably nap on your patio is one of the most popular reasons for adding a bed to an outdoor living space. Napping outside in the fresh air is a relaxing experience that every member of the family can enjoy. 2. Read: You can read in a chair, but there is something much more inviting about a larger space where you can curl up with a good book and spend the afternoon reading outside. 3. Watch Movies: If you have a backyard movie theater, a patio bed is a great place to settle in with a bowl of popcorn to watch your favorite flick. If you do not have a patio movie screen, you can always settle in with your tablet or watch movies on your phone. 4. Play Games: A queen-size bed is plenty of room for your family to gather for a board game, or you can go the modern route and wrap up in a blanket on the bed to play games on your smartphone. 5. Cuddle Under the Stars: Cuddling with your partner, kids or dog is a great way to start or end the day, but it can be even more enjoyable if it takes place outside. 7. Work: A patio bed is meant to be a place to relax, and working is not usually considered a very relaxing experience. But if you have to work from home, it will certainly be at least a bit more relaxing if you can do it in comfort outside. 8. 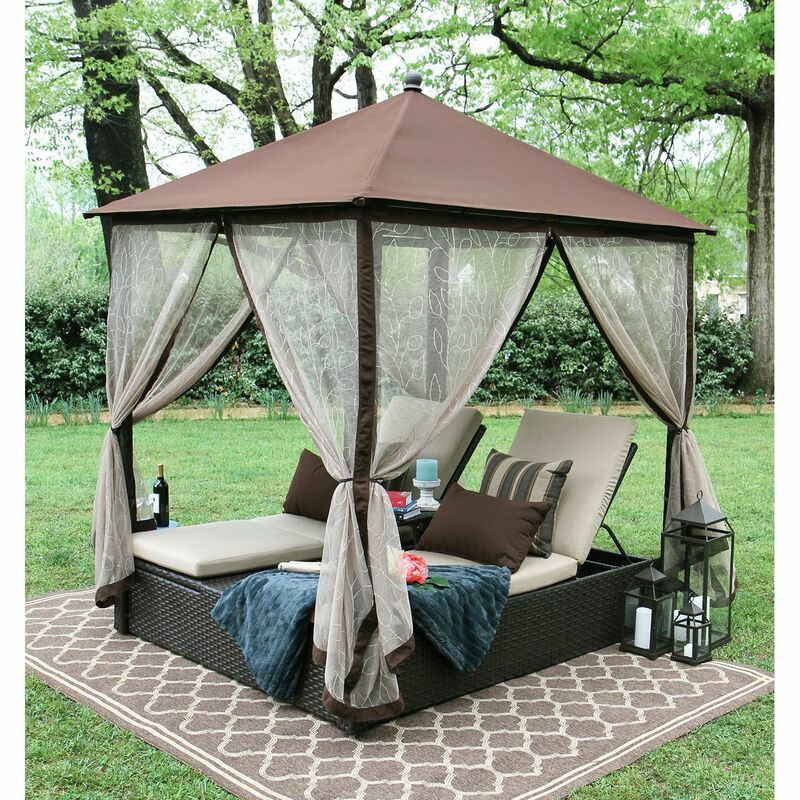 Enjoy Your Morning Coffee: For those who prefer to greet the day with a cup of coffee in hand, there is perhaps no better place to enjoy that first cup than lounging on backyard beds. 9. Watch the Sunrise or Sunset: Another benefit of beginning or ending your day by relaxing in your outdoor bed is that you can watch the sun rise or set while under the covers. 10. 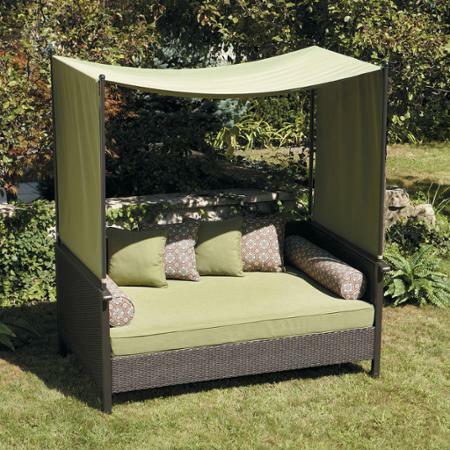 Host a Slumber Party: Backyard beds can take your children’s slumber parties outdoors and to a whole new level of fun. Your outdoor sleeping area could be a simple as a sleeping bag in a makeshift tent or as luxurious as a king-sized bed with an upscale mattress hanging from chains over a paving stone patio. To help you decide the type of backyard bed that is right for you, here are 10 options to consider. 1. Hammock: Hammocks are easy, affordable outdoor bed options that are often portable and often take up less space than other options. 2. Murphy Bed: A Murphy bed might be a good choice for you if you want a patio bed but do not have much room on your patio. 3. 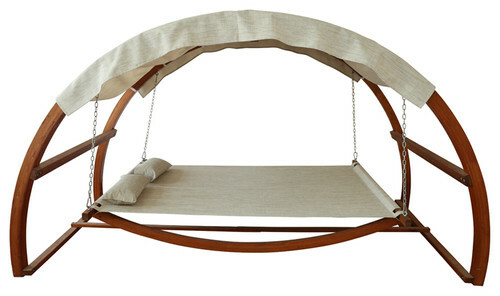 Hanging Beds: If you have a sturdy cover over your patio, you might consider a hanging bed. They look fantastic and are one of the few options that will not cover up the design of your paving stone patio that you so carefully chose and might want to show off to guests. You can use chains, cables or wooden posts to hang your bed and can dress it up to match the rest of your patio furniture. 4. 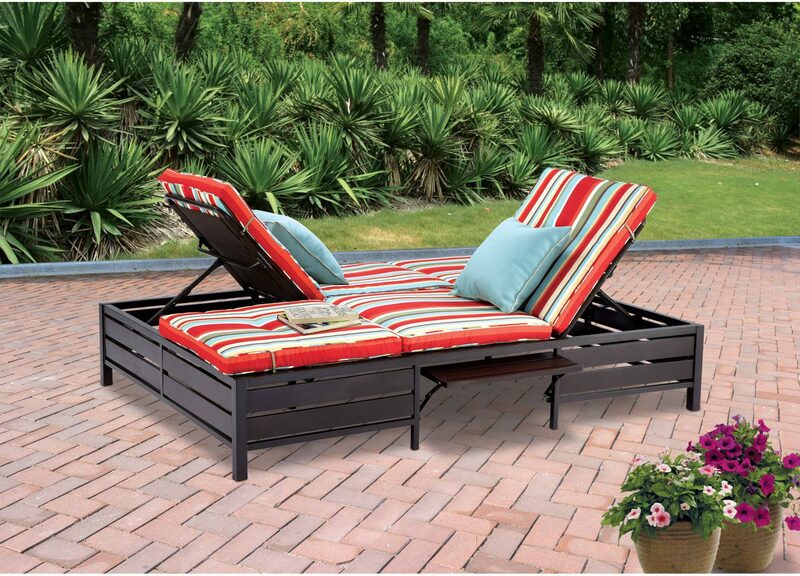 Outdoor Daybeds: Daybeds designed for use outdoors are widely available and easy to find online and in stores. This is a great option for folks who want something that can be used as a bed or a sofa. 5. Reclining Chaise Lounges: This tried-and-true option is another one that can do double duty by providing a nice place to curl up with a book or a comfy lounger for sunbathing by the pool. While they may not be quite as roomy and comfortable as other options, they are easy to find and often more affordable. 6. Double Chaise Lounges: A little harder to find but well worth the effort, double chaise lounges provide ample space for napping or relaxing. Some available options have two sides that face each other, which also makes this a great option for relaxing outside while catching up with a friend over a glass of wine. 7. Old Bed Frame: An old, metal bed frame is an inexpensive option that adds a bit of whimsy to your yard and goes great with a cottage look or English garden. They can also be outfitted with conventional bedding for truly bringing your indoor sleeping experience outdoors. 8. 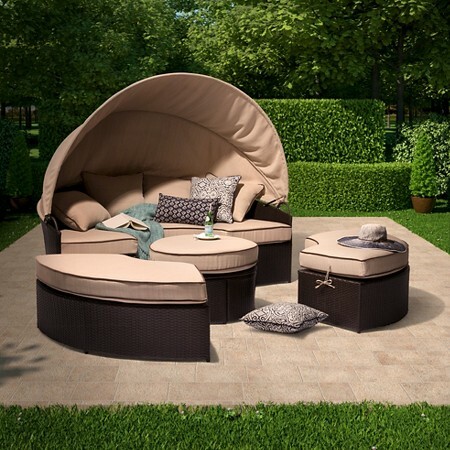 Round Patio Beds with Canopies or Umbrellas: You may have seen this type of backyard beds in magazines or in photos of beachside resorts in the Caribbean. 9. Floor Cushions: Create a comfortable hangout space that is low to the ground and easy to move around by creating a patio bed with floor cushions. 10. Freestanding, Off-the-Ground Beds: This could include hanging beds with standalone frames, freestanding hammocks, or even high decks that you can walk beneath or climb a ladder to the bed at the top. 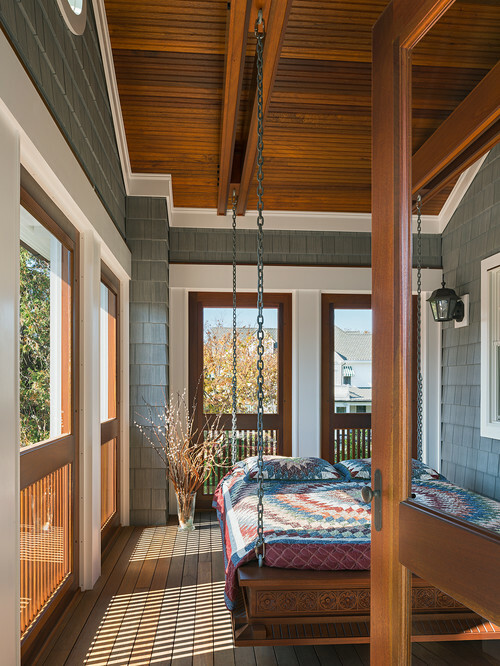 When you see outdoor bedrooms and patio beds in magazines or online, they are always perfectly made and look incredibly cozy. But we have to remember that these pictures are staged and that real backyard beds are not going to stay so perfect and clean. Textiles will fade if left in the sun, everything is going to get dirty and, if you have dogs, you might as well say good bye to the tassels on your throw pillows. Get a deck box or storage cabinet to store your bedding when not in use. Invest in mosquito netting to make outdoor sleeping a bug-free experience. Make sure your bed has some sort of cover to protect it and you from sun and rain. Make sure your bed frame has a weather-resistant finish. If you use a conventional mattress, protect it from the elements. Remember to apply sunscreen before taking a nap outdoors. You can provide cover for your outdoor bed with a tent, teepee, gazebo, yurt, retractable awning or canopy. If your backyard bed is not on a paving stone patio, you may want to consider installing artificial grass in your outdoor bedroom area. Opting for synthetic turf can make your backyard bed a more comfortable place to hang out, since there is no mud after rain, and no soil or wet blades of grass to get on your bedding. Natural grass comes with lots of pests, so opting for manufactured grass can also mean swatting fewer bugs while you are trying to sleep or enjoy a book.